I'm busy making my 6 year old's party dreams come true this week. He is having a Superhero Training Academy Party on Saturday. We did this party for my other son when he was 5 and it was a hit. Hopefully I'll be able to share some of the things I make as I go. 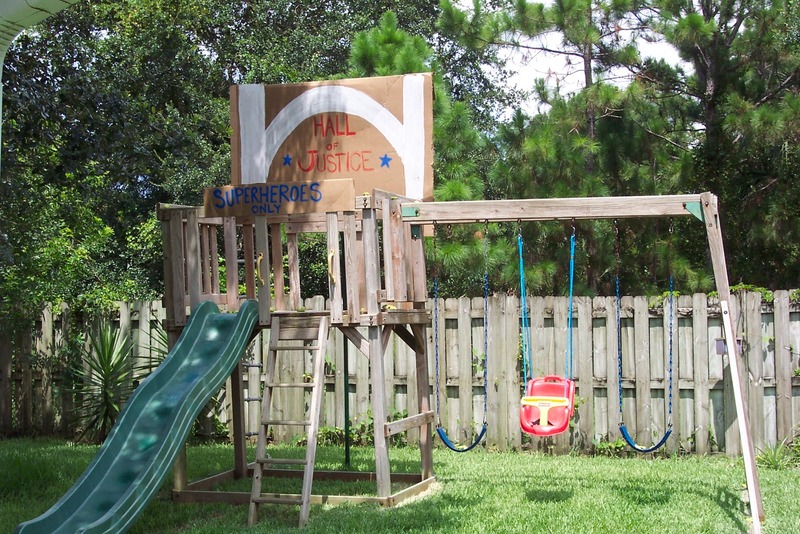 I scrounged up a huge piece of cardboard and painted a Hall of Justice to dress up the swingset. We are going to need Headquarters to protect for one or our activities. A couple of signs + one swingset = Instant Superhero Headquarters. Here's a picture of the one we made a few years ago. We just hammered nails through the cardboard into the wood.